Marcus Garvey once said: “A people without the knowledge of their past history, origin and culture is like a tree without roots.” Roots & Branches executive director Tamla Matthews knows this all too well. It’s why she’s created a program to inspire young people to celebrate their heritage. Through her program, Tamla not only teaches the artistry of traditional African and Caribbean dance, she also infuses cultural knowledge and pride into her students. 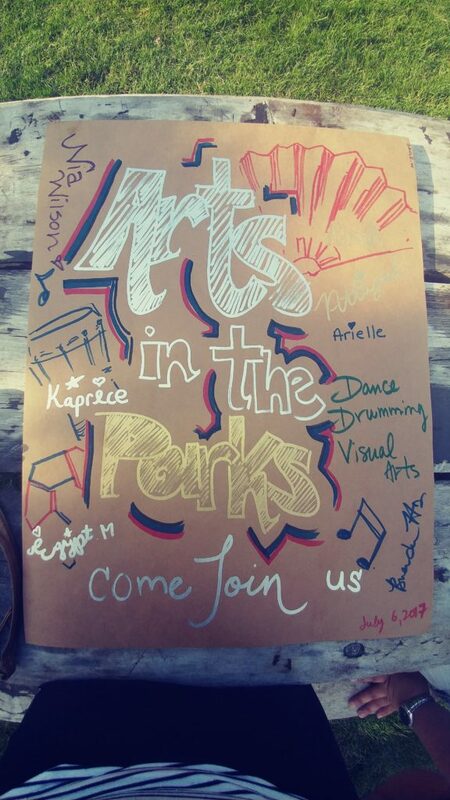 For Arts in the Parks this summer, Tamla has brought us a taste of what she does through her Routes & Journeys program. Last week I enjoyed an evening with the talented Roots & Branches dance crew in Bluffer’s Park. After an impromptu (but extremely fun) dance lesson, I caught up with Tamla Matthews to find out more about her program and what it means for the community. How did Roots & Branches come about? I come from a background in dance and have been dancing my whole life. I even ran a number of dance programs in the city. But then I had my daughter, got married and my life changed a little bit. It was around this time that I began thinking about building a sense of community for my daughter that was similar to my own growing up –where everyone was a big extension of your family. That really came about through dance. 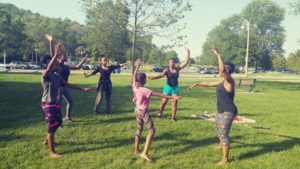 I began looking into whether or not my community wanted a program like this, and started hosting Saturday workshops through the City’s Family Dance Day programs. Christine Mornahan, the then executive director of Dance Umbrella of Ontario, came to me one day said “You know Tamla, I really think you should keep doing this.” She was the one who really helped me get Roots & Branches off the ground. And now here we are. We just celebrated the end of our sixth year and we’re starting year 7. What does ‘dance’ mean to you? For me, my experience of dance was about family and community. Dances were a place where the family got together to hang out –all the parents are in the hallways cracking jokes, (you can’t even hear the music they’re talking so loud) –and the kids are inside dancing [laughs]. That’s my way of experiencing dance, and I wanted my daughter to have the same experiences that I did. I wanted a community of dance that wasn’t just about me dropping off my daughter at a studio for two hours. It’s something where everyone gets involved. When the parents bring their children to Roots & Branches, I tell them to stay, help us make costumes in the hallway or come drum for the class. I like to pull the whole family in. What’s the thing you enjoy the most about running the Roots & Branches program? It’s not easy work but it feels good. Especially when I can see that our kids are developing a better sense of themselves and that they’re more confident. We’ve also grown into a large family. A number of the people that I’ve taught over the years are now teachers at Roots & Branches. At the same time, we attract a lot of new people who just like the idea of cultural pride being expressed through dance and the preforming arts. I can see the confidence in the children, especially in the fact that they’re able to choreograph an entire dance on their own. That’s amazing. I take that completely for granted and I only remember when new people come to the program. I can see that they’re not used to coming up with their own dance moves but eventually they get into it. But I love to draw everyone in to dance with us. Not when it’s someone like me, you don’t want to see me dance! [Laughs] We do! And that’s the thing, we make space for the whole community to come and join us. Some of our volunteers hate dancing but I always say ‘Come! Join us” and it’s fun, we laugh and it makes the kids want to try too. You said something that I think is really important –that you ‘make space.’ I think you do that in a lot of ways by making space for new ideas, opportunities, people and cultural experience. Is that something you value? Yes. It’s been so interesting to see the different kinds of people that have been joining us out here at Routes & Journeys. 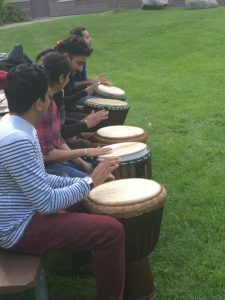 We’ve had people from all backgrounds come to play the drums with us. Once, a South Asian man came out to play on the drums and I noticed him doing a Tabla drum technique. I recognized right away and saw that he was a drummer too! When we play rhythms from our own traditions and cultures it’s still able to speak to all of us. So It’s really cool to see how different cultures can come together to share and value the same experiences. It’s something I really appreciate about this program. Attend Routes & Journeys this summer!